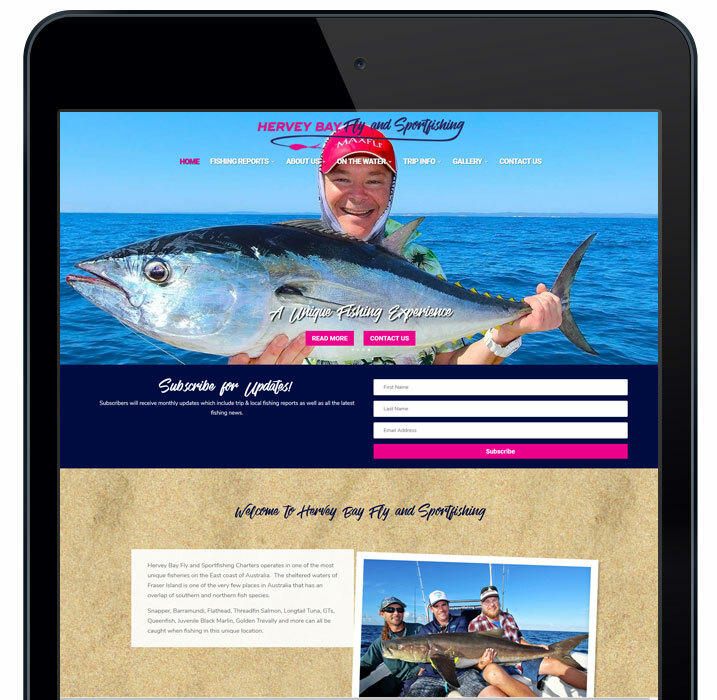 Hervey Bay Fly and Sportfishing which is based in Hervey Bay, Queensland, Australia is another local graphic and web design client of Jen Mulligan Design. Andrew worked with Jen to firstly revamp their logo design to ensure it would fit with the new website design which was next on the to do list. Both Jen and Andrew worked hard on the new website layout and content resulting in a bright, eye-catching design with informative content about the fishing charter services Andrew offers and other information about the area and fishing in general. The website is powered by the very popular WordPress content management system which is one of the latest tools in website development allowing for easy maintenance and updating of the site. Hervey Bay Fly and Sportfishing also takes advantage of Jen Mulligan Design’s monthly maintenance service which ensures piece of mind that the website is always kept up to date and any content changes or updates are just a quick email away. Andrew’s monthly fishing report newsletter is also uploaded to the website as part of the monthly maintenance plan. 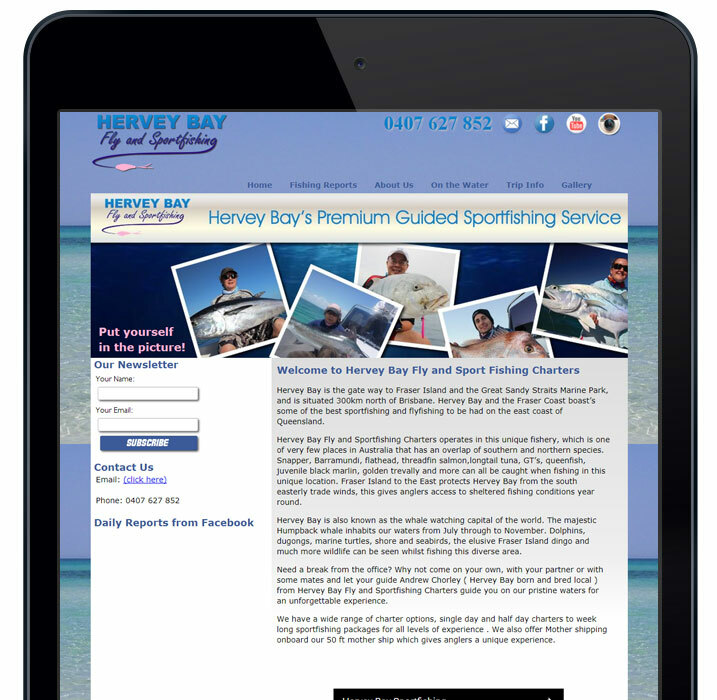 Prior to the redesign, the Hervey Bay Fly and Sportfishing website struggled to cater to mobile devices and the layout was looking a little dated. In addition to this the owner, Andrew wanted a brighter look and feel and thought it was the right time to make his business look more professional online. 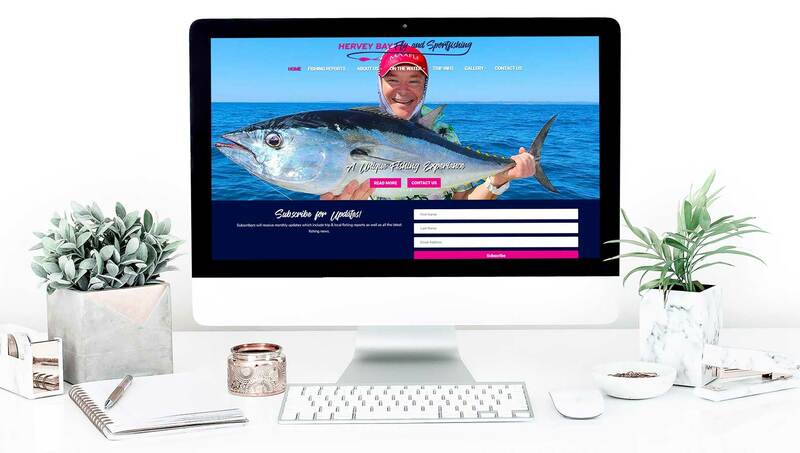 After the website design revamp, Hervey Bay Fly and Sportfishing have a professionally designed website that matches their fun nature with beautiful bright imagery that showcases just what you can expect from one of their fishing charters. The new website is hooked in to their newsletter system so signups are effortless while being optimised to display on mobiles, tablets & desktops.